Little is known about the lost village of Hamlin, which was in existence for just over 50 years and was located where the Ludington State Park now stands. In 1852, Charles Mears purchased land along the Big Sable River, in search of a mill location. 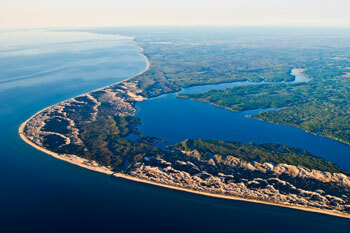 The mouth of "Big Sable Lake," with its narrow stream to Lake Michigan seemed the ideal location. Mears built the first wooden dam and established a sawmill in 1856. This dam was located a few hundred feet downstream from the present-day dam, and raised the lake 12-15 feet. A smaller, wooden dam in the lower Sable held back water to create a large holding pond for logs...thus the creation of Hamlin Lake. In 1860, Mears renamed his Little Sable settlement Lincoln and the Big Sable settlement and lake Hamlin, in honor of Mears' choice for president and vice president, Abraham Lincoln and Hannibal Hamlin. Mears owned rights to more than 200 million feet of standing timber in Mason and Lake counties. Logs were cut in winter, stacked on the ice, and moved down into Hamlin Lake each spring. The Mud Hen was built in 1865 to move the logs about Hamlin Lake, and was the first steam-powered boat in the region, operating for over 50 years. Near the dam, the water-powered shingle mill cut about 15 million shingles a year and employed 60 men. Mules pulled carts loaded with shingles along a narrow-gauge railway from the mill, along the river to the docks. Other logs floated downriver to the holding pond. The logs were then cut at the steam-powered mills near the Lake Michigan docks. Hamlin was a bustling village in the 1870s, consisting of mills, boarding houses, sheds, stores, and a schoolhouse. Then in 1888, the wooden dam collapsed. A huge wall of water moved houses, buildings, and debris into Lake Michigan. A second dam was built, but in 1912, that one too, broke...and washed away all remnants of the village of Hamlin. A few dwellings remained until the 1930s, but they were removed by the Civilian Conservation Corps in preparation for construction of the new state park. Since the demise of the lumber industry, there was no need to build a functional dam. But along the Hamlin Lake shoreline (the former holding pond), businesses, homes, and resorts had begun to spring up, establishing what is now known as a beautiful vacation getaway, the Hamlin Lake area. A new, concrete dam was completed in 1914, about 100 yards upstream from the original dam, within the Ludington State Park. And underneath Hamlin Lake lies a bit of Mason County history...a 50-year-old village that played an important part in the development of this region. A piece of Hamlin history can be toured at Ludington's Historic White Pine Village, as well. The relocation of a log cabin known as "Hamlin Lake Cottage" from Indian Pete Bayou to White Pine Village was completed in 2015. Thousands of man hours went into disassembling the cabin and reassembling it on a concrete slab within the village.